Although the United States economy is in good shape – with essentially full employment and an inflation rate close to 2% – a world of uncertainty makes it worthwhile to consider what could go wrong in the year ahead. After all, if the US economy runs into serious trouble, there will be adverse consequences for Europe, Japan, and many other countries. But within the US, the greatest risk is a sharp decline in asset prices, which would squeeze households and firms, leading to a collapse of aggregate demand. I am not predicting that this will happen. 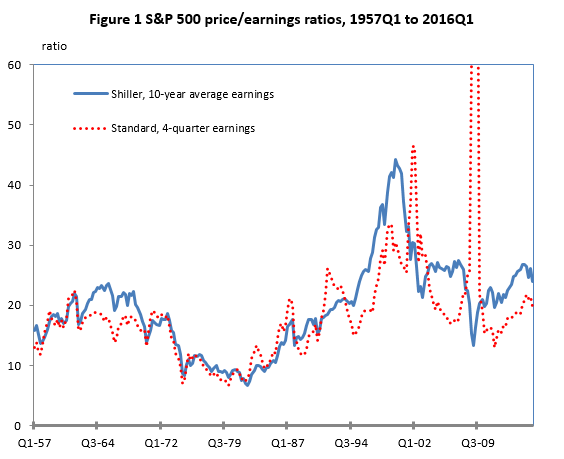 But conditions are becoming more dangerous as asset prices rise further and further from historic norms. The fall in household wealth would reduce spending and cause a decline in GDP. A rough rule of thumb implies that every $100 decline in wealth leads to a $4 decline in household spending. The return of asset prices to historic levels could therefore imply a decline of $400 billion in consumer spending, equal to about 2.5% of GDP, which would start a process of mutually reinforcing declines in incomes and spending leading to an even greater cumulative impact on GDP. Because institutional investors respond to international differences in asset prices and asset yields, the large declines in US asset prices would be mirrored by similar declines in asset prices in other developed countries. Those price declines would reduce incomes and spending in other countries, with the impact spread globally through reduced imports and exports. But the fear of triggering a rapid decline in asset prices is one of the key reasons why the US Federal Reserve is reluctant to raise short-term interest rates more rapidly. The Fed increased the overnight rate by just 0.25% in December 2015 and is likely to add just another 25 basis points in December 2016. But that will still leave the federal funds rate at less than 1%. With the inflation rate close to 2%, the real federal funds rate would still be negative.